Earnings HQ: FBN’s Lori Rothman breaks down Delta Air Lines’ first-quarter earnings report. 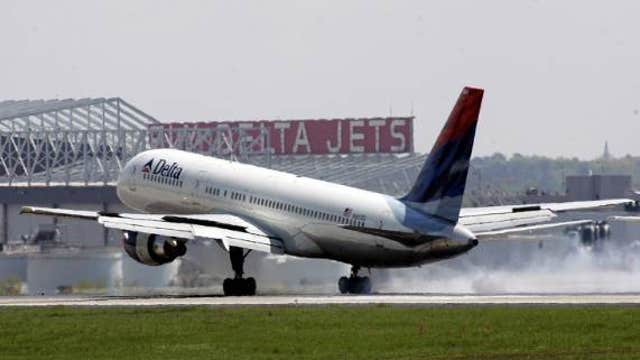 Delta Air Lines on Wednesday reported a higher-than-expected first quarter profit as revenue rose and the company benefited from lower fuel and plane maintenance costs. Shares were up in premarket trading as Delta forecast that operating margin, a measure of income to costs, would expand in the current period. "Delta has continually proven their ability to execute their strategic plan," Cowen & Co airline analyst Helane Becker said in a note to clients, adding that the carrier did "an exceptional job" holding down costs. Delta, the third-largest U.S. airline behind American Airlines Group Inc and United Continental Holdings Inc , said gains in business revenue and fees for items such as seat upgrades and baggage would bolster the second quarter. In the first quarter, passenger revenue rose in the United States and Latin America and fell in the Atlantic and Pacific regions. Delta cancelled more than 17,000 flights in the quarter because of bad weather, costing it $90 million in revenue. Net income was $213 million, or 25 cents a share, up from $7 million, or one cent a share, for the year-earlier first period. Excluding items such as fuel-hedge contract adjustments and charges for fleet changes, profit was 33 cents a share, compared with 29 cents expected by analysts on average, according to Thomson Reuters I/B/E/S. Quarterly revenue rose 5 percent to $8.92 billion. Yield, a a measure of the average airfare paid per mile flown, rose 1 percent to 17.21 cents. Passenger revenue per available seat mile, or unit revenue, rose 3 percent to 14.24 cents. Total operating expenses were roughly flat in the quarter. Costs for fuel and related taxes fell 3 percent and expenses tied to maintenance of aircraft dropped 9 percent. Atlanta-based Delta bolstered revenue by charging more for seats with greater leg room, replacing 50-seat jets with larger, more efficient planes while buying a refinery to help reduce fuel costs. Delta said it expected operating margin of 14 percent to 16 percent for the second quarter, better than the year-earlier period&apos;s 11 percent. It forecast that unit revenue would rise in the mid-single-digit percentage range in the second period. Shares of Delta were up 5 percent to $36.78 in premarket trade on Wednesday.